Video transcript (trailer) - Ten years after Maddie's disappearance, Gonçalo Amaral returns to the crime scene. An exclusive documentary with new clues and unprecedented footage. 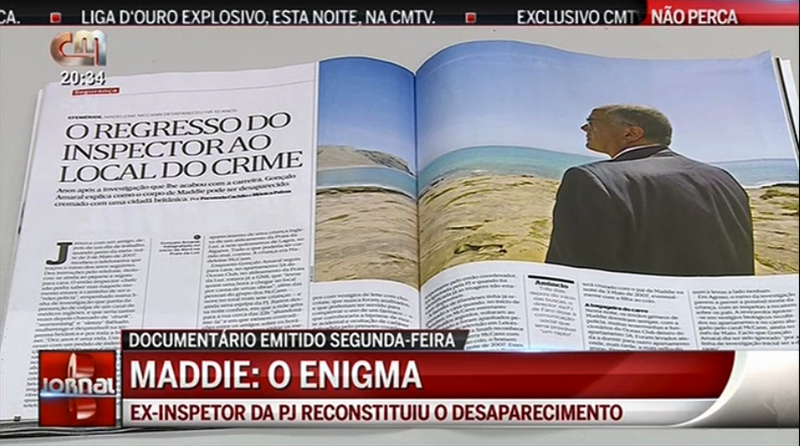 Maddie: The Enigma, an in-depth report by CMTV. José Carlos Castro (CMTV News Anchor) - Gonçalo Amaral says that there was far too much diplomacy and even servility towards the British in the Maddie Case. These statements were published in this week's Sábado magazine, they are part of the documentary Maddie: the Enigma to be broadcast by CMTV next Monday to mark the ten years of the English child's disappearance. Cut to footage from the report, unknown voice over - Gonçalo Amaral has returned to Praia da Luz in the Algarve to reconstitute the steps of the disappearance of Maddie McCann. Ten years later, the former Judiciary Police inspector has no doubts whatsoever that there was too much diplomacy and servility from the Portuguese authorities towards the British. This disclosures were published in this week's edition of Sábado magazine and are also part of the documentary Maddie: the Enigma that is going to be broadcast next Monday on CMTV. Gonçalo Amaral, footage from the report - "The failure as I told you comes from this, it started immediately, nearly twenty-four hours later after that happened we had the (British) ambassador here and that is when the great political pressure starts. (...) It seems that we still have a certain submissiveness before the United Kingdom. (...) We sent the samples that were collected in the apartment to the English forensic laboratory when it could have been done in a Portuguese laboratory so we wouldn't be criticized, so no one could say that we had manipulated the final results, so Portugal wouldn't be called into question because in essence those were English authorities, those were English suspects, so we asked them to check the samples and the reality is that we were naive." Voice over - Gonçalo Amaral was in charge of the Maddie case however he was dismissed of the post of coordinator of the Judiciary Police of Portimão after he criticized the performance of the English police. Gonçalo Amaral - "What should have been done at the time and wasn't, was that the parents who were in fact responsible for the safekeeping of the child should have been suspected from the start, with what that entails and is necessary for the investigation namely the interception of telephone calls, surveillance, etc, of the parents but also of their group of friends, because we don't know, suppose for a moment that when that group of friends go to the apartment the child was still there, we have no idea if that happened or not." Voice over - Gonçalo Amaral believes that Maddie's body was placed inside the casket where the remains of a British woman were, a coffin that was cremated later. This thesis emerged (from a statement) in December 2007 after three shadowy figures were seen entering the church with a bag. Thank you Joana! Your hard work is much appreciated!